For membership information, see below. 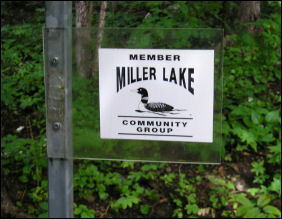 The Miller Lake Community Group is an Ontario incorporated (#1284695) non-profit association designed to represent and provide a forum for the landowners on and around Miller Lake. Promote the interests of the members before Municipal and Provincial boards, councils, tribunals and commissions, with respect to zoning, development, taxes, services and such other matters that may affect the interests of the membership. To provide social and recreational activities for the membership. held annual meetings to all members to bring forward questions and concerns for all to consider. These meetings are regularly attended by the North Bruce Penninsula Mayor who will discuss any local municipal concerns with us and keep our association appraised of local issues. In light of recent events with provincial government changes to taxation and responsibilities it is even more important that we all keep abreast of how these will affect us in the Miller Lake community. We want to hear your concerns, keep you informed and provide a meeting place for all our neighbours. Your enjoyment (hunting, fishing, swimming, hiking and other activities on and around the lake) is of mutual concern to many others and we ask if you are not part of our association that you join us and meet some new friends. To join the Miller Lake Community Group, you can CLICK AND PRINT this form. Membership dues are a measly $20 per year.